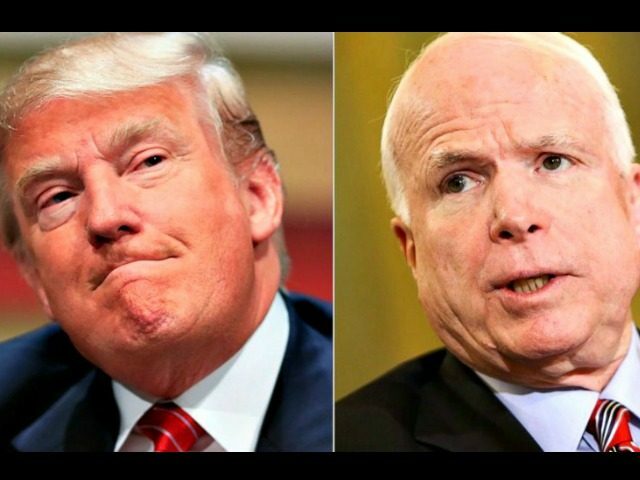 President Donald Trump tweeted a video on Monday of Sen. John McCain (R-AZ) promising to repeal and replace Obamacare 13 times. McCain derailed Obamacare repeal twice since Trump became president. Sen. John McCain first tanked Obamacare repeal in August when McCain and Sens. Susan Collins and Lisa Murkowski (R-AK) voted against the “skinny” repeal bill of Obamacare. McCain complained that the process for repealing Obamacare did not allow for potential changes proposed by Arizona Gov. Doug Ducey. McCain then announced last Friday that he would oppose the Graham-Cassidy Obamacare repeal bill, even though Gov. Ducey endorsed the Obamacare repeal block grant proposal.